The Rohr McHenry Distilling Company was one of the most important industries in Benton and Columbia County during the latter part of the 1800s and the first decade of the last century. Everyone who has dunked their toes in Fishing Creek knows the story of McHenry Whiskey, sold nationally under the direction of John Geiser McHenry (1868-1912), businessman and United States Congressman. Let's start near the beginning. 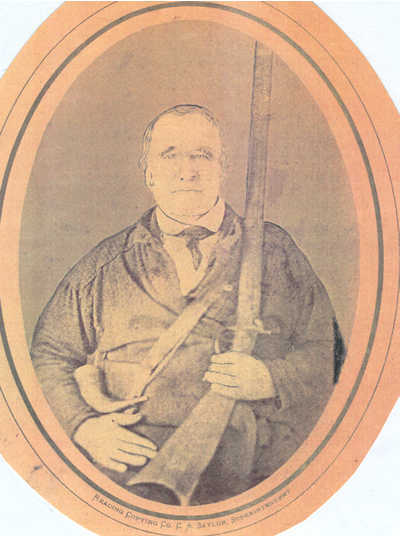 John McHenry, known as "Hunter John," was born September 13, 1785, and is frequently referred to as being the "first white child born north of Knob Mountain in Fishing Creek Valley." He was number five of nine children of Daniel and Mary (Stephens) McHenry. Hunter John claimed he shot a total of approximately four thousand deer starting when he was 13 years old. He kept track by means of notches in hickory sticks. A stick with five hundred notches was given a place of distinction on a rack above his fireplace. There are tales of deer horns piled higher than the eves behind Hunter John's house. In 1812, John McHenry started the McHenry Distillery, which remained in operation for over a hundred years and in many respects was the mainstay of the local economy for much of that time. John and Helena have many descendants in the upper Fishing Creek valley. John died in 1868. Helena died in 1850. Both are buried at Stillwater. 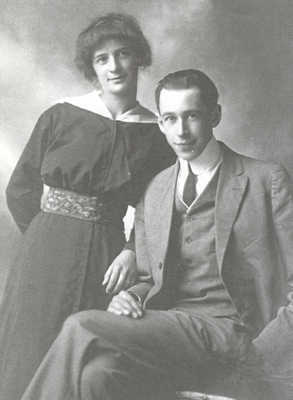 John McHenry married Helena Cutter. Helena Cutter's parents were Samuel Cutter and Mary Cole Cutter. Mary Cole was the Daugher of Ezekiel Cole, uncle of the Ezekiel Cole of Greystone fame. Mary was born in Hunterdon County, NJ in 1767. Now to confuse you further, Mary's grandparent's Tunis and Sara Cole had several sons, including Benjamin and Ezekiel (father of Mary) . Benjamin had a son and named him Ezekiel, the one who moved to Columbia County and built the Greystone and the mill at Coles Creek. Therefore, Mary's father Ezekiel was Ezekiel's uncle. From a tin type of Hunter John. Rohr had this picture of him in his home, John Geiser McHenry Sr. had it on the wall of his home with "Hunter" John's musket above it. John McHenry and Helena Cutter McHenry had nine children. The last, a son Rohr, was named for Frederick Rohr. A Prussian who fought against Napoleon and fled to America, Frederick Rohr became a land owner and founded the town of Rohrsburg. Rohr McHenry was born in Benton Township in 1829, attended local schools, and was one of the forty-four men wrongfully imprisoned at Ft. Mifflin in 1864 as part of what was often called the Fishing Creek Confederacy. He eventually took over the "Still House," the name locals gave to the McHenry home, when his father died and the business on Whiskey Hill grew from home-brew to commercial. A plant was constructed. The whiskey he produced became known locally as "Old Rohr," which many felt in discreet quantities could cure everything from snake bites to typhoid fever. 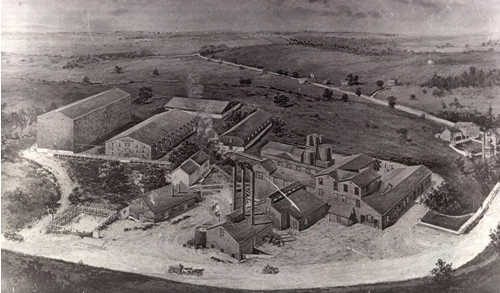 A very early picture of the distillery. He was a shrewd businessman involved in distilling whiskey, farming, lumbering, merchandising and public affairs. He served for two terms as County Commissioner and held other local offices. Caroline Geiser McHenry donated a plot of ground beside the present Market Street adjacent to Fishing Creek and in 1902 a Presbyterian Church building was started. It became occupied in 1903. Eleven years later, on May 16, 1913, fire gutted the building. 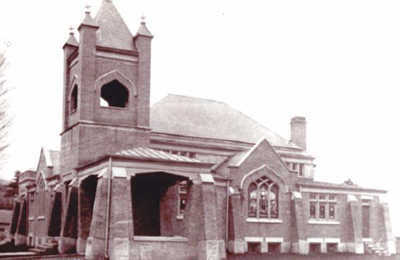 The present Church was placed in service in 1915. This Church cost $21,000 and was made of wood and brick. On May 15, 1913, the Church was gutted by fire after being spared in the great fire of July 4, 1910. 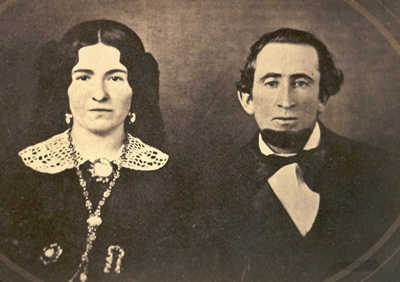 Rohr and Caroline had five children: George, Henrietta, Louisa, Charles, and John Geiser. Rohr McHenry and his entire family are buried in the Benton cemetery. John Geiser McHenry, on the right in the adjacent picture, was born in Benton April 26, 1868. John Geiser became the politician of the family, a Democrat, by the way. 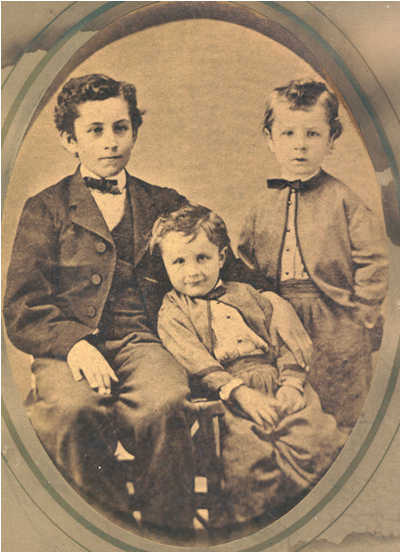 George (the oldest), Charles and John G. McHenry. The two daughters, Louisa and Henrietta, died very young. Rohr McHenry (1829-1912) successfully operated the distillery on Whiskey Hill, about a mile and a half west of Benton, that his father had started. The "Still House" was very popular with local farmers who filled their jugs almost every time they went up Whiskey Hill--purely for medicinal use, of course. Rohr's popular drink had good sales locally and he seemed satisfied with that and appeared to have no aspirations for expansion. 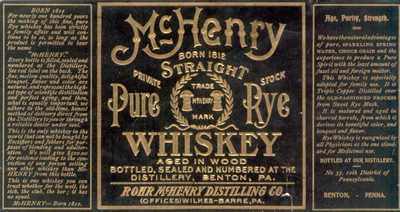 A McHenry ad in the Benton Argus commented that the firm's "strictly pure rye whiskey" was "double distilled in a copper lined doubler, from thoroughly cleaned rye and pure spring water," turned out at 100 gallons a day. A $500 reward was offered for "any corn or drugs found in our whiskey as it leaves our salesroom." The ad claimed that the drink was "recommended by all the leading physicians" for medical purposes. Rohr was the father of Congressman John G. McHenry. To save time and energy, we'll just call John Geiser, "John G."
John G. was educated in the public schools of Benton, drove a lumber team in his youth and probably spent his early years dreaming of hanging out his shingle as a lawyer. After graduating from the Orangeville Academy, however, he launched into a business career as a farmer, manufacturer, banker, distiller and politician. 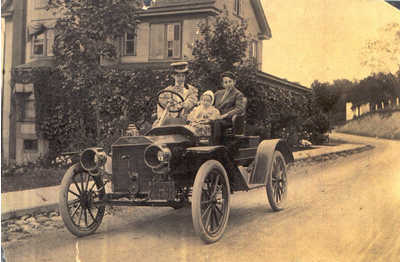 Small child is DeArmand and older boy is John G. Jr.
(in a one-of-a-kind" Watrous two-seater at the far end). 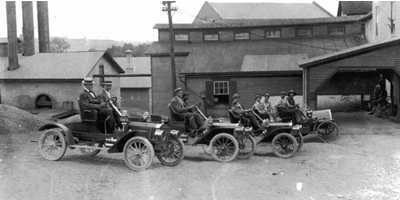 Photo courtesy of the Columbia County Historical Society. Reprints may be purchased from the Society. John was quoted as saying about the Watrous"the man only built the one because most of the time it didn't work." This picture was taken about 1908, four years before the warehouse was destroyed by fire. The roof of the warehouse is shown in the background. An opening can be seen to the rear of the front car. The opening is a coal chute designed so coal wagons could be backed up, a "trap" in the floor of the wagon opened and the coal dumped into the furnace area. The building behind the three cars was the mash vat house where the spirits were distilled. The row of small windows at the top were vents for allowing the steam to escape from the building. The building with the three stacks was the boiler house and its shell and the remains of an old reservoir on the property tend to be all of the remains that most Bentonians can now remember. Here again there was a chute arrangement which opened up under a wagon and the wagon was so built that an opening in the bottom was sprung allowing the grain to spill from the wagons into the bins below. Through the opening between the boiler house and the vat house was the drying house. Grain residue was placed in this building for drying after distilling was complete, then sold or used for feeding cattle and hogs. At one time the distilling company operated Pioneer farms where hogs were fattened with the residue and then shipped to slaughter houses in many areas of the east. Whole cattle carloads of young pigs were received by freight on the old Bloomsburg and Sullivan Railroad. The youth of Benton looked forward to these train loads. Kids would the herds of pigs from the railroad siding at Market Street up Distillery Hill to the farm south of the plant. When John G. began working for his father in managing the operation, things began to change. He stressed the date that business began, using the slogan "Born 1812." After Rohr's death, John G. became firmly in charge. 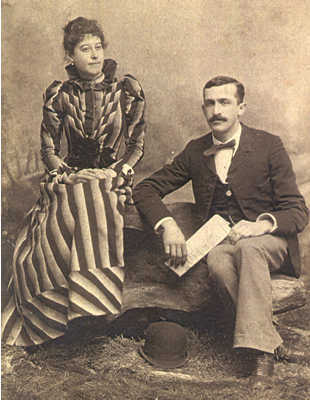 John G. and Mary Wolfe McHenry. This picture is thought to have been taken on their wedding day. John G. and Mary Wolfe married and they had two sons: John G., Jr. and DeArmand. 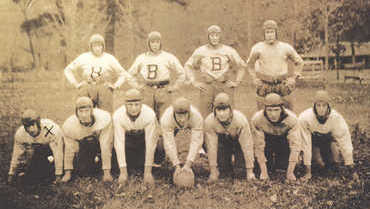 The player with the X on the shoulder is DeArmand McHenry, youngest of John G. and Mary E. McHenry's sons. He wrote a letter stating that theirs was an excellent team and were involved in a district or state game, the whole town traveled to attend. In Jauary, 2003, he is in poor health but is still living. DeArmand was a medical doctor in York, PA.
Mary, John, DeArmand, John, Jr.
John G. and Mary had a tennis court on the hill along with a gazebo and swings, etc. 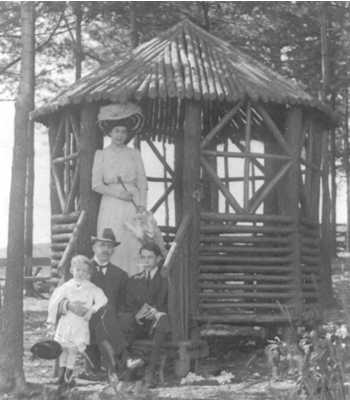 They apparently entertained in this area and this family photo was taken there. Judging from DeArmand's size, the picture must have been taken about 1910. John G. had a summer cottage with an office, his law books, and a living area built on the hill across the road and field up on the hill overlooking Benton where Scott and Janice Maguire now live. A view of Benton looking East, taken from the tennis court on the hill. 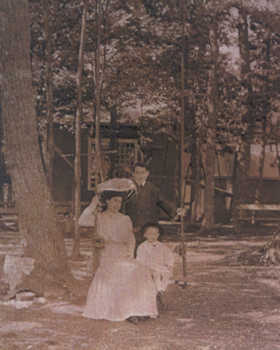 The picture shows John G., John G., Jr., Mary and DeArmand. This picture of John G. McHenry was taken in the library and study that stood on the hill overlooking the distillery. Congressman McHenry is at the table. John G. McHenry is reading in front of the fireplace. Mrs. McHenry is at the piano and their youngest son, DeArmond, is on the piano bench. 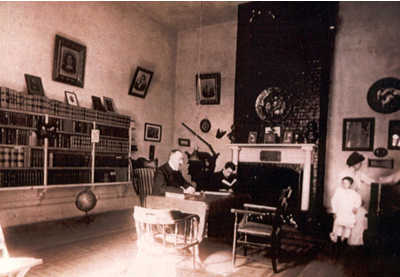 The portrait on the wall to the left of the fireplace is of Rohr McHenry. The rifle and moccasins hanging under the picture belonged to "Hunter" John McHenry.There are many books in the backgound. John Jr. got his law degree but never practiced. This is one of the last sketches of the distillery. To get your frame of reference, picture the location of the McHenry house in the upper right corner of the sketch. The bonding house is shown on the left. This building was ten stories with basement, and burned in March, 1911. Only one barrel out of 17,000 was saved. Newspaper advertising carried the McHenry message, eventually covering much of the nation. The famous label of the Rohr McHenry Distilling Co.
"REWARD. We will give $100.00 for evidence leading to the detection of any one refilling the McHenry bottles with any other whisky or adulterating the McHenry Whiskey in any manner or for selling something else and calling it McHenry when McHenry is asked for. Rohr McHenry Distilling Co. This whiskey is the product of selected Rye and Malt pure mountain spring water and scientific distilling with years of perfect aging in charred barrels in heated warehouses and coming direct from us it brings to you the finest & purest Whiskey made, and costs you no more than the other brands. Business was just wonderful, not just for the distillery, but also for the local farmers as rye became the crop of choice. Hundreds of farm wagons made by N. P. Moore, the Appleman Wagon Works and the Long Wagon Words hauled rye to the distillery from throughout the area. Photo courtest of Doris Harvey. It came from a post card originally written by Zell Long to Mrs. Stanley Long, Berwick. and dates from 1912. The bond house, shown above on the left, was a ten-story brick building, holding 17,000 barrels of whiskey for aging. The aged whiskey moved out and new whiskey moved in. It is probable that if events had not gone sour, the distillery, if still in operation today, would be huge and the whisky making profitable. The facility expanded, but John G.'s salesmen brought in orders faster than they could be filled. Loading Rohr McHenry & Son whiskey at the storage shed, Bloomsburg & Sullivan Station. The storage shed is still at Market and Fifth Streets, Benton. After studying at the Orangeville Academy, he launched into a business career, and eventually was also a farmer, manufacturer, banker and politician. John G. became interested in politics, possibly as a way of attaining more power than was possible just by being a distiller. He easily was elected to the Sixtieth Congress. His charisma and business ability got him elected U.S. congressman for three terms starting in 1906, serving until 1912 when he died. He was successful as a congressman and served "his constituency with the utmost brilliance and efficiency" as a member of the Appropriations Committee. He was named to several important committees in Congress, and a great deal of his time was spent in Washington away from his beloved Benton and his distillery and his many other interests. One of the bills he sponsored asked for the appointment of an agricultural scientist to be located in every congressional district where agriculture is a leading industry." He often said that "if the soil of Germany and England, a thousand years older than our soil and in a less favorable climate, can produce 28 to 32 bushels of wheat per acre there is no excuse for our producing an average of 12 to 14 bushels." His congressional colleagues considered him first and above all a farmer. One of his interests was banking. He seemed to have a natural aptitude for banking and finance. He was instrumental in establishing a series of Grange banks and planned these banks in each state, tied to the agricultural side of business. Grange banks attempted to loan money at rates lower than other commercial banks but Grange activities proved unsuccessful because of lack of capital. The bank was destroyed in the July 4, 1910, Benton fire. Columbia County Farmers National Bank was created. Prior to the 1910 fire, this bank was located in a frame building on Main Street next to the building housing the present Kozy Korner restaurant at Main Street and Market Street, Benton. 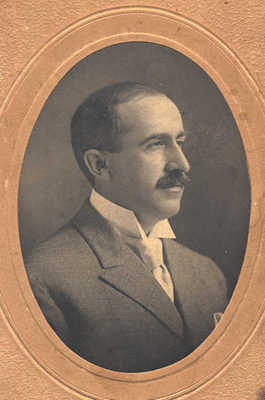 John G. McHenry organized the Columbia County National Bank of Benton in 1902 and served as president for many years. At the time, directors were J. Boyd McHenry, Alfred McHenry, Charles A. Wesley, Russell Karns, C. F. Seely, George B. Hummer, and W. L. Yorks. The capital of the bank was placed at $25,000. 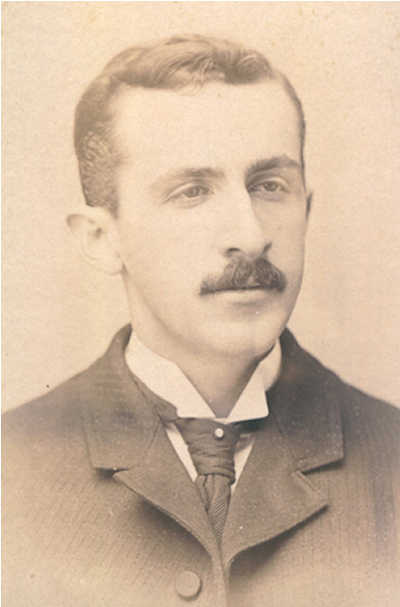 John G. organized the People's Department Store of Benton shortly after he entered Congress, with many local people investing in stock of the corporation. Local residents could trade in stock and produce for goods and necessities. It proved his partial undoing when he picked the wrong person to operate it, a man who knew nothing about what people of the area wanted. Shelves were filled with fancy goods of no local value. The store failed to provide what purchasers wanted and the manager was even described as "wasteful and extravagant." 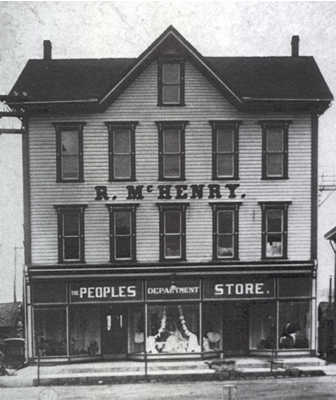 The People's Department Store was located accross the street from the intersection of Main Street and Market Street, approximately where the lawn area of the CCFNB bank is today. 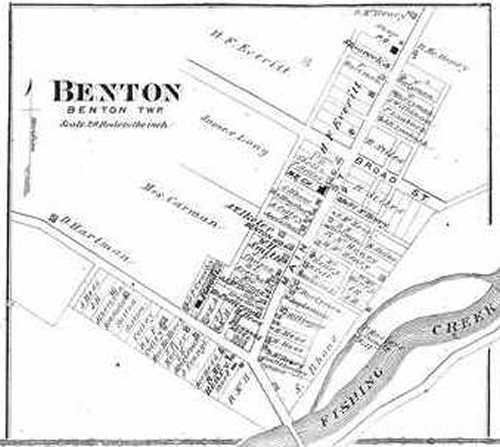 On this map of Benton, the store is marked, "R. McHenry Store." The continuation of Main Street South did not occur until after the fire of 1910. The store burned in the fire of July 4, 1910, and the people who had bought stock in the venture were left without the store, the stock or their money. Insurance satisfied the wholesale firms, but left everyone else stranded. A second business venture of John G. also did not go well. He had 30,000 peach trees planted on what John G. called Pioneer Farms, apparently planning to add peach brandy to whiskey as a future McHenry product. Peach trees take up to 15 years to produce, so the operation was strictly a money loser. Other farm crops, including rye, were grown under the watchful eye of a State College professor and the care of three dozen employees. A vinyard was planted. The farm was under the direct personal supervision of Prof. M. E. Chubbuck, a graduate in agricultural science from the State College, as it was then called, in State College. The farm also included building for the incubating and breeding of poultry on a large scale. Local farmers watched and predicted the financial outcome. 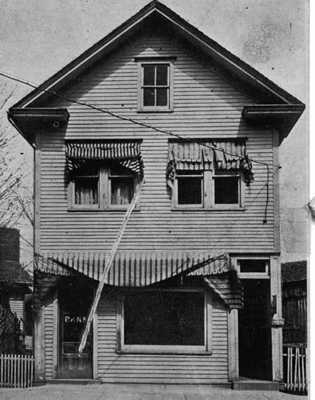 This bond house was destroyed by fire in March, 1911. The big fire that destroyed the 10-story bond house with its approximately 17,000 barrels of ripened or near-ripened whiskey in March, 1911, was a real blow to the McHenry operation. The building cost about $50,000 to build and was considered fireproof. Although much of the plant was saved and production was maintained, even good rye whiskey right out of the distillery must be aged and during that aging process valuable money gets frittered away. Sixteen months after the bond-house fire, in September, 1912, rumors of insolvency of the McHenry business empire began circulating. The congressman attended the Democratic Convention that nominated Woodrow Wilson, the last public function he attended. When he returned to Benton and his home on the hill, friends said he "looked terrible" and for the first time residents realized that John G. was seriously ill.
John G. later entered a sanitarium in New York State, recovered enough to go to Atlantic City, then to the Mercy Hospital in Philadelphia and then he came Back Home to Benton, PA to die. The bank he founded was forced to appoint a receiver for the distilling company. The Pioneer Farms toppled. On the night of the foreclosure of Pioneer Farms, John G., then 46, passed away. He was laid to rest at the Benton cemetery in an impressive ceremony attended by a huge number of people. A beloved friend had departed. Congressional colleagues and local residents, the rich and the poor, gathered in shock and silence at his passing. The business of the House of Representatives was suspended February 16, 1913, in order for members to pay tribute to the memory of the Hon. John Geiser McHenry. On February 27, 1913, Mr. Gregg of Pennsylvania, said of John Geiser McHenry, "he was a gentleman. He was kind and considerate. He was at all times modest and retiring, yet he remembered the dignity of his position in life. He belonged to that old-fashioned, honest class of gentlemen that is fast disappearing. The world needs more of them--the ones who meet one with the glad handclasp and the cheery good morning. Such as John McHenry. Long will he live in the memory of his associates, and longer will he live in the thoughts and lives and hearts of his constituency. What more can I say than that--His life was gentle, and the elements So mix'd in him, that Nature might stand up And say to all the world, "This was a man." Following that speech, the House adjourned until February 17, 1913 at 12 o'clock noon. The Senate of the United States passed a resolution (S. Res. 483) that, as a mark of respect to the memory of his death, suspended the order of business of the United States Senate. The distillery had gone into receivership shortly before John G.'s death, and closed in 1913. One by one, local businesses defaulted payment, including Hummer and Yorks Lumber Company in Elk Grove and the Benton Electric Light Heat and Power Company. The affairs of the man and the company became a hopeless jumble, with everything turning into a financial nightmare. John McHenry, Jr. and his bride Naoma Hess. He graduated from the George Washington University law School in 1924. McHenry tombstone in the beautiful Benton cemetery. 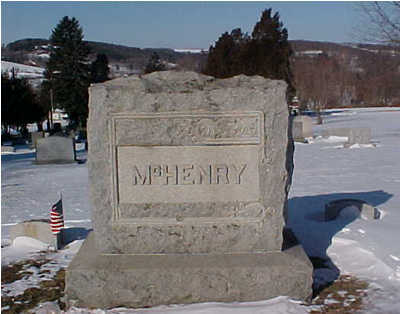 The tombstone of John G. McHenry is to your left; the tombstone of his wife,Mary, is to your right. In 1962, John Paden, 84, narrowly escaped death in a fire of the century and a half old boiler house of the Benton Distillery. Paden operated a museum and lived in the building at the time. After the fire, only the stone walls of the building remained. Fire destroyed the building. 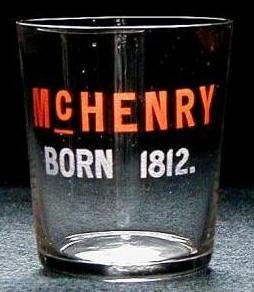 This is an example of the type of McHenry Shot Glass that is currently for sale. A typical price for a glass of this type is $85. 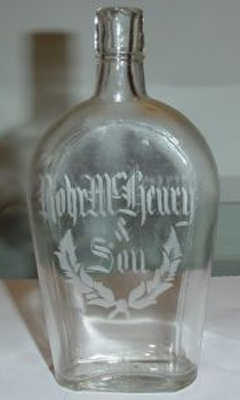 This McHenry bottle is shown as an example of the type of collector bottle that is very popular. It sold on eBay for $521.02 January 16, 2003. The bottle is marked Rohr McHenry & Son.